Apartments ( 2000 / 2010 Monterey Road in San Jose, California ) is a low income / HUD subsidized apartment complex operated by EAH Housing. While employed with Santa Clara County, the Public Guardian coordinated with Markham Plaza Property Management to facilitate the Fraudulent eviction of Heidi Yauman, a traumatic brain injury survivor. Heidi Yauman was a Markham Plaza Resident who was also conserved by the Santa Clara County Public Guardian. Lee Pullen’s neighbor, Ryan Austin Mayberry was the attorney representing Markham Plaza Apartments. EAH Housing President and CEO: Mary Murtagh had been notified of the problems at Markham Plaza Apartments yet failed to supervise the activity of her staff and behaves complacently by not holding Markham Plaza staff accountable for their criminal actions against Heidi Yauman. 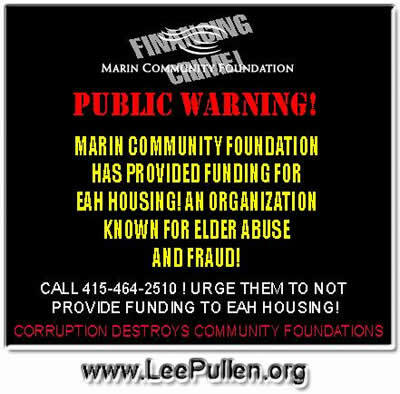 Additionally, Lee Pullen is also known to have ties with the Marin Community Foundation which has provided at least $100,000 to EAH Housing Please alert the Marin Community Foundation and others about EAH Housing Fraud and Mr. Lee Pullen. PLEASE URGE EVERYBODY TO NOT DO BUSINESS WITH EAH HOUSING & TO NOT PROVIDE THEM WITH SUPPORT OR FUNDING.